Sarah Susanka discusses The Not So Big Life: Making Room for What Really Matters. Sarah Susanka promotes The Not So Big Life. 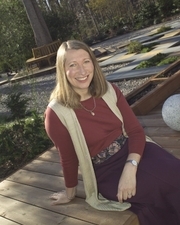 Sarah Susanka is a bestselling author, architect, and cultural visionary. Her "build better, not bigger" approach to residential architecture has been embraced across the country, and her "Not So Big" philosophy has sparked an international dialogue, evolving beyond our houses and into how we inhabit our lives. In addition to sharing her insights with Oprah Winfrey and Charlie Rose, Susanka has been named a "Fast 50" innovator by Fast Company, a "top newsmaker" by Newsweek, an "innovator in American culture" by U.S.News & World Report, and is this year's recipient of the Anne Morrow Lindbergh Award for "outstanding individual achievement, a spirit of initiative, and work that exemplifies great dedication toward making positive contributions to our world." Sarah Susanka is currently considered a "single author." If one or more works are by a distinct, homonymous authors, go ahead and split the author. Sarah Susanka is composed of 4 names. You can examine and separate out names.